Although he was of the royal lineage of King David, he wore no crown and was not a senator, scholar, or world traveler, but a man of few spoken or written words who taught by his example and who seldom ventured beyond the boundaries of his own homeland. Oft times he is pictured with his foster son together in his carpenter shop, patiently teaching him the humble wood-working trade, holding a hammer, chisel, or measuring rule in his steady yet un-courtly calloused hands. 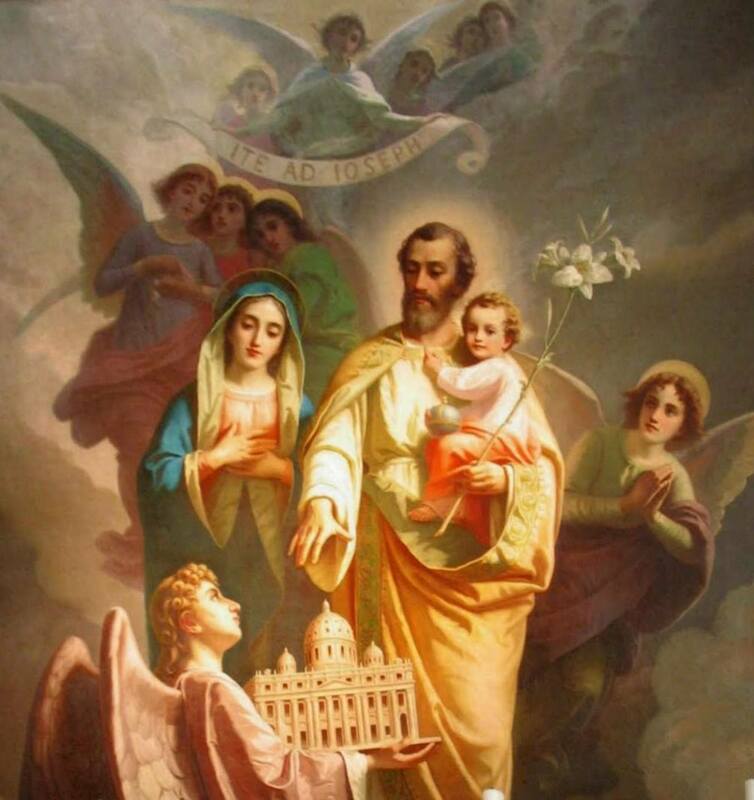 There seems to be no mystery why God would choose such a just man with a soul of simplicity to be the guardian and head of the Holiest of Families, the most priceless treasure ever to be bestowed on mankind. For he was there to share his fatherly teaching through day to day basic lessons of life with the boy Jesus and his bride Mother Mary, for he possessed the gifts of true humility and an honesty scarce to find. When first he was told by his beloved betrothed that the Holy Spirit had come, he was heavy in heart, and had to contemplate for awhile, for never was there an event in the history of humanity that produced such a child. Then he too was visited by an angel who whispered soothing truths that filled him with the lightness of joyful anticipation of the glorious occurrence, which calmed his restless mind with a peace so tender and mild. After the long and strenuous journey to Bethlehem, the town of his birth, where the census was being collected, the arrival of “The Promised One” was very near and the inns were full, so he had to find shelter for them to be safe and protected. There was but one place left to rest their weary heads: a straw-laden stable where the beasts of burden were fed as they warmed the air with their breath and lay in their makeshift beds. This is where these “Blessed Three” were finally divinely directed. The birth of God’s only begotten Son then lit up the night, and in the distance the shepherds beheld the star that was brighter than bright. Then Joseph tucked the infant close into his mother’s loving embrace as was approaching the nearness of the morn. They were later awoken by those from far off fields kneeling reverently in adoration and awe at their door, mixing among the gentle creatures to gaze upon the anointed one’s face, which would soon bring a new dawn! At the presentation in the temple of Jerusalem, Joseph was the sole comforter of the Virgin Mary when the prophecy of Simeon predicted a sword would pierce her Immaculate Heart, and through a warning in a dream, he took flight to Egypt to avoid Herod’s wrath. His plight was met with patience and perseverance as he prayed through his trials for sanctifying grace, and continued on his self sacrificial mission, becoming the closest man to Our Savior ever to walk the Earth on the ultimate path of righteousness. For his virtuous example as a model of fatherhood and head of the Holy Family, he is honored as Protector of the Church.